Natural Balance L.I.D. 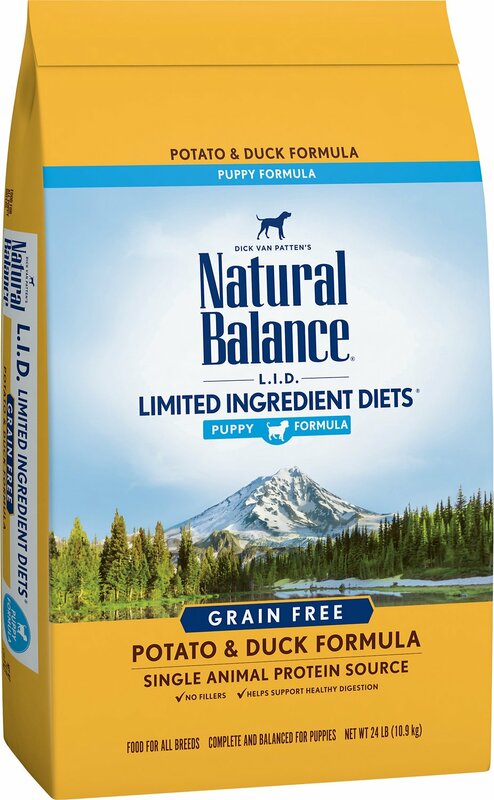 Limited Ingredient Diets give you quality food with fewer ingredients in their Puppy Formula Potato & Duck Formula Dry Dog Food. 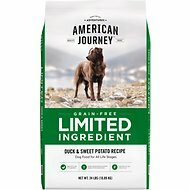 This premium recipe limits the number of carbohydrate sources and uses only a single source of unique duck protein to minimize your pet’s exposure to possible allergens. The kibble is puppy-sized for smaller mouths and delivers healthy omegas and DHA from salmon oil to help support his neural development. A grain-free recipe with limited carbohydrates and no artificial flavors or colors. High-quality nutrition aids in good overall health. Smaller kibble size is perfect for smaller mouths. Omega- 3 fatty acid from flaxseeds gives dogs a healthy and shiny coat. With a single animal protein source this formula is perfect for pup’s with food sensitivities. Potatoes, Duck Meal, Duck, Potato Protein, Canola Oil (Preserved with Mixed Tocopherols), Dried Potato Products, Natural Flavor, Salmon Oil (Preserved with Mixed Tocopherols), Flaxseed, Salt, Dl-Methionine, Choline Chloride, Vitamins (Vitamin E Supplement, Niacin, D-Calcium Pantothenate, Vitamin A Supplement, Riboflavin Supplement, Thiamine Mononitrate, Vitamin D3 Supplement, Pyridoxine Hydrochloride, Folic Acid, Biotin, Vitamin B12 Supplement), Minerals (Zinc Proteinate, Zinc Sulfate, Ferrous Sulfate, Iron Proteinate, Copper Sulfate, Copper Proteinate, Manganese Sulfate, Manganese Proteinate, Calcium Iodate, Sodium Selenite), Potassium Chloride, Taurine, Mixed Tocopherols (Preservative), Rosemary Extract, Green Tea Extract, Spearmint Extract. These feeding guidelines are suggested only, feeding amounts may vary by breed, activity level, temperament and climate. Puppies Adjust feeding amounts to maintain steady growth and ideal body condition throughout your puppy’s growth period. Puppies that become larger Adult dogs will grow more slowly and for more months than small dogs. This product is meant to be fed to growing puppies and pregnant or nursing Adult dogs. Puppies should be fed 3 meals per day up to 6 months of age and then twice a day. Provide daily amounts of food divided into the smaller meals. Moisten food until just soft for the early weaning period. Pick up left over food and discard in order to maintain freshness. As puppies grow teeth and can bite dry food, reduce the amount of water added to the food. Amounts will depend on age, activity, environment and temperament. Helping to decrease dog obesity means keeping your puppy at ideal body condition throughout its growth and early Adulthood. Puppies that become small/medium size dogs (up to 70 lbs) can be transitioned to Natural Balance's All Life Stages Formulas at 9 - 12 months. Puppies that become larger size dogs (over 70 lbs) can be transitioned to Natural Balance's All Life Stage Formulas at 12 - 18 months. Pregnant and Nursing Dogs Adjust feeding amounts in order to maintain ideal body condition. Feed multiple meals per day with daily amounts divided into smaller meals. Can be moistened. For pregnant dogs, minimal increase is needed during first 6 weeks of pregnancy. After 6 weeks, until whelping, increase amount of food up to 25% more than normal Adult maintenance amounts. For nursing dogs, begin increasing amount fed immediately after whelping. Depending on the size of the litter, the amounts needed to maintain ideal body condition will increase up to 50% more than normal Adult maintenance amounts. Get your puppy off to a good start with a first and then regular veterinary visits. Keep fresh water available at all times. 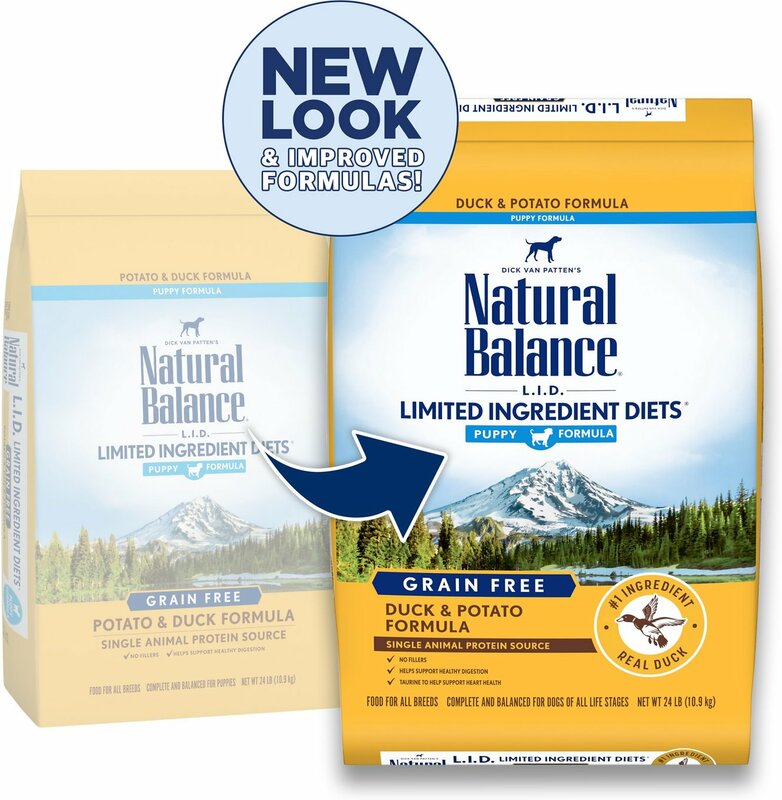 Natural Balance Limited Ingredient Diet wet and dry dog foods are crafted using a single-source protein and limited carbohydrate sources for a complete and balanced blend. It's perfect for dogs with food sensitivities or pet parents who want to minimize the number of ingredients their pets are exposed to. These limited ingredient diet recipes include a single protein source and are available in traditional and unique options. And with a limited list of high-quality, complex carbohydrate sources, these recipes help maintain your dog's digestive health and balance. Each protein is paired with a perfect carbohydrate source for incredible flavor and health benefits. Provides a great source of fiber, along with magnesium, phosphorus, selenium and key B vitamins. Garbonzo beans and peas are complex carbs and grain-free sources of energy, fiber and protein. Premium, grain-free carbohydrate that offers potassium and serves as a highly digestible energy source. These formulas contain balanced levels of omega-3 and 6 fatty acids that help to maintain healthy skin and a luxurious coat. And they never include artificial flavors, colors or preservatives, so you can feel good about feeding your favorite pooch this wholesome diet. Finally a food that works for stomach issues! My dog has a sensitive stomach. It takes weeks to switch foods. I bought a bag of this through a local pet store. My dog did great after the initial transition. I was so excited to buy another bag but through Chewy and not need to transition. Imagine my surprise and anger when I opened the bag to see that the dog food was a lighter brown, the individual pieces were shaped a little different, and the outside of the bag was slightly redesigned. I wrote to Natural Balance about a formula change, with no response. 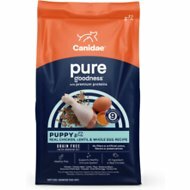 I am dealing with an 8 month old puppy with diarrhea, trying to transition to this "new" food. So mad. My little buddy has food alergies and cant eat chicken, beef or fish. Duck is my only meat he tollerates I feed him this brand duck and potato canned as well as treats. On the recommendation of our vet we switched to Natural Balanace because we had noticed a lot of scratching on another chicken flavored food. Since we have changed, our puppy has been scratching much less! I started my 8-month-old lab on this when he was 7 weeks old. He's beautiful, strong, and has a gorgeous shiny coat. I'll keep it up and than switch to an adult formula. Seems to work. This food saved my sanity. Our lab pup had constant loose poop on the food her breeder had used and we continued. This resulted in her pooping in her crate all the time. I was losing my mind. Several vet checks revealed no issues. Probiotics. Prescription dog food. No change. Finally connected that she was good when we were on bland chicken and rice so perhaps there was an additive in the food bothering her. Tried this. Immediate success. We've been on it for 3 months now and her poops are solid and her crate clean. This is a great food for puppies, especially if you're trying to eliminate food allergies. My vet recommended this and we are happy with it. Our Hazel loves it -- so far so good! My gsd puppy had constant diarrhea and itchy skin and hair loss. His vet diagnosed him with food allergies and after unsuccessfully trying different foods, the vet put him on prescription food which worked for the itching skin but he was still itching his ears a lot and his diarrhea worsened and he would occasionally throw up. After researching I decided to transition him to this food. EVEN during the transition (mixing his old food with the new) his stools hardened. Now he has had solid stool for a month and his coat is so shiny and his hair is growing better than ever! No more bald spots on his ears. Gus has been on this since he was about 3 months old, I got him from a rescue that had him on science diet but we found out he was allergic to chicken so had to find another option. Gus at first liked this but as he got older (he's 7 months now) he started to walk away from it, only take a couple of bites and get bored. I would put peanut butter and it would help but he got bored again. So I called to cancel the autoship and return the food I just received, they were so helpful and gave me a full refund and now I get to donate the food to the rescue I got my baby from! Thanks chewy you guys are awesome. Finally a dog food my Geeat Dane puppy can eat! We found she has an allergy to chicken. Most all dog food has chicken in it somewhere. This one does not. Our local stores don't carry the puppy formula so I've used the adult duck until I could get it shipped. She ate it just fine without stomach upset. She loves the canned as well as the treats! I'm thrilled! This is our 6th food. Our last resort and it is working! The numbers for the protein, fat, calcium and phosphorus are right in there for my little Great Dane puppy. Thank you!!! !